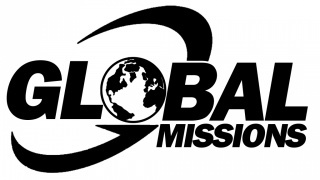 Our Global Missions Team is designed to partner with Nazarene World Missions and justice seeking organizations in order to take the Gospel message to the ends of the Earth. Mike Romanack serves as our Global Mission Team leader by organizing and determining future partnerships and opportunities. Contact our office or see Mike to get involved and learn more about it! The Maclay's are heading to Hong Kong! Erin (Evans) Maclay grew up much of her life right here in Flushing, MI. Her parents (Floyd & Ellen) are active attendees at FCC and we are excited to be the "sending church" for Erin & Ian to take this bold step of moving to Hong Kong in January 2018. This couple has been called to make a real difference in the global community for Christ. Their mission is to build relationships within a cross-cultural community to train up other global Christians and to reach out to un-reached ethnic minorities. Learn more by reaching out to them at iemaclay@gmail.com. 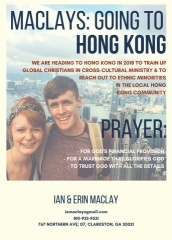 The Maclay's are being to sent to Hong Kong through Global Grace Fellowship (their funding and support group) but will be doing much of their work on the ground through Gateway Ministries (their ministry organization). See the links below to learn more about these organizations! In 2014, we had 12 friends participate in a full or half marathon and raised over $10,000 to end the water crisis in Africa. In 2015, Pastor Terry participated in an Ironman 70.3 event and raised over $4,000. Every $50 will safe a life and bring fresh water to a young woman or child. In 2016, Dori DeVuyst felt led to run the Detroit Marathon with TWV. 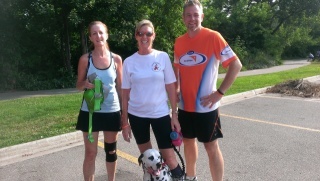 Unfortunately, Dori suffered an injury to her foot and so we adjusted and completed the goal by running with relay team! In 2017, Mike & Dori DeVuyst each ran the half marathon at Detroit to once again impact the lives of children and families in Africa through Team World Vision. See Terry if you are interested in learning more about Team World Vision. You can also learn more at www.teamworldvision.org!